The Kristall (Crystal) is an original and uncommon Soviet SLR. Its production was short - from 1961 to 1962 and only 65, 433 copies were made. It may seem like a lot, but given usual Soviet production numbers in hundreds of thousands and millions, and the fact that Kristall was not exported makes it a rare and desirable collectible. The camera belongs to the Zenit line of the Soviet made SLRs. It is best known for its art deco top cover, which was cast and painted in a gray "hammered" enamel. This finish gives the Kristall its unique "tool" look. This camera was also the first Zenit with a hinged back door, all previous model were bottom loaders, since they were based on a Zorki-S (Leica copy). The camera also featured a winding lever instead of a knob. 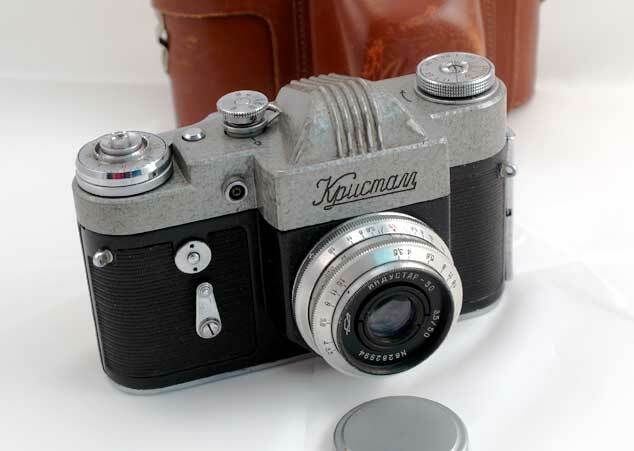 The Kristall was soon replaced with the Zenit-3M; identical camera, but with the usual stamped and chrome finished top cover. 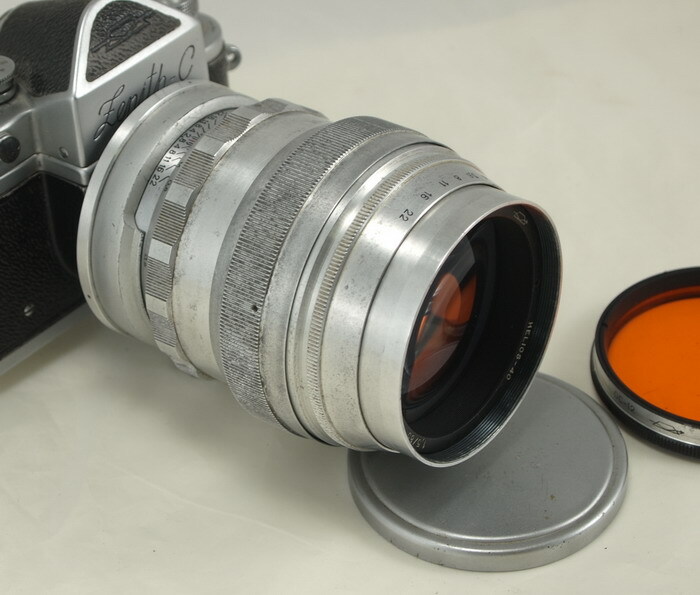 Lens: Industar-50, F=5 cm, 1:3.5, coated, still 39 mm mount, but the optical registration is different from the Leica type lenses. Leica threadmount lenses will fit the camera mount, but can be used for close-ups only. Flash synch mechanism with two settings - flash and bulb. This Kristall was made by the KMZ plant in 1962. The camera is in GOOD condition, it shows some age and wear. There are some paint rubs on the prism housing (caused by the case). The camera comes with a clean sturdy leather case (no neck strap) and a plastic lenscap. The Kristall is a nice compact user and an uncommon and attractive collectible camera.